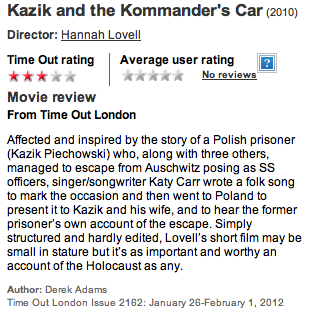 Affected and inspired by the story of a Polish prisoner (Kazik Piechowski) who, along with three others, managed to escape from Auschwitz posing as SS officers, singer/songwriter Katy Carr wrote a folk song to mark the occasion and then went to Poland to present it to Kazik and his wife, and to hear the former prisoner’s own account of the escape. Simply structured and hardly edited, Lovell’s short film may be small in stature but it’s as important and worthy an account of the Holocaust as any. This entry was posted in Reviews by Katy. Bookmark the permalink.